After the BMW 2002, the baton for sporty-box seems to have passed over to VW. However, their sporty box was a hatchback, and in certain markets, that carried a down-market stigma. To address some of that concern, VW transferred all the GTI goodies to their Jetta in 1984, creating the Jetta GLI. Performance was still not totally on the order of the 2002tii, so we have to wait for hobbyist geniuses to start dropping the 1980s 16-valve engine from second-generation GLIs, GTIs, and Sciroccos into the Mk1 Jetta. With roughly 134hp and 2000 lb., and the great suspension set-up from a GTI, you should have a fun little rocket nobody will expect – sound familiar? 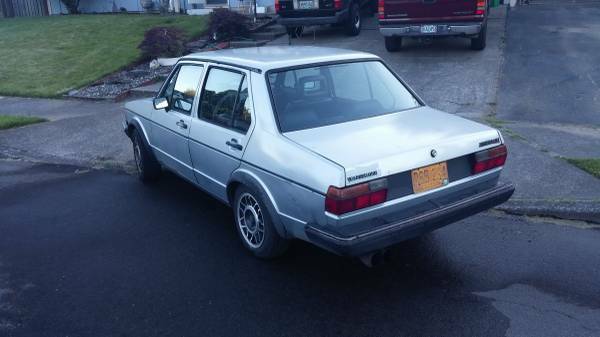 Check out this 1983 VW Jetta Mk1 16V for sale for $2250 in Gresham, OR. The silver finish seems surprisingly free of defects, particularly on the upward-facing surfaces. Or maybe it’s just a wet car on a cloudy day. Blacked out trim, snowflake wheels, bumpers and fender flares carry over the look of a GLI, though that option was not available until the following year. It does look to have some bubbling on the door bottoms, although that requires a lot of squinting at the pictures, so you’ll want to ask the seller for more detail. Square and sharing so much with its stablemate, the Audi Fox, and its Brazilian cousin, the VW Fox – it’s a wonder how much use VW got out of that basic design theme. The old Oregon yellow-and-blue plates are cool, suggesting it’s been there for much of its life, while the twin-tip extra-large DTM-style tailpipe needs to go, to be replaced with something more period and less droning. If a little light rust and a new exhaust is all you’re looking at, you’re pretty far ahead of the game at this point. 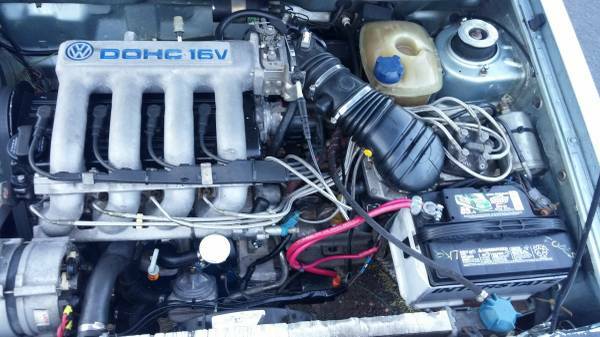 And here’s that pretty engine – not quite as attractive an intake manifold as an SHO, 928, or Alfa 164, but still pretty high up on the list. The power and flexibility of the engine will do a lot to make this car a winner on the road, or on the autocross track. 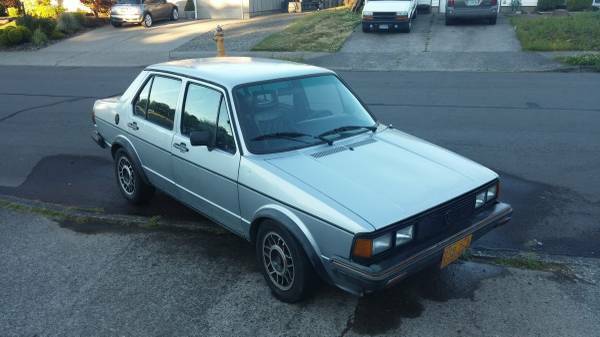 With a conversion comes some risk – perhaps there’s a build thread on VWVortex, or the seller can provide more detail so you know the development is sound. 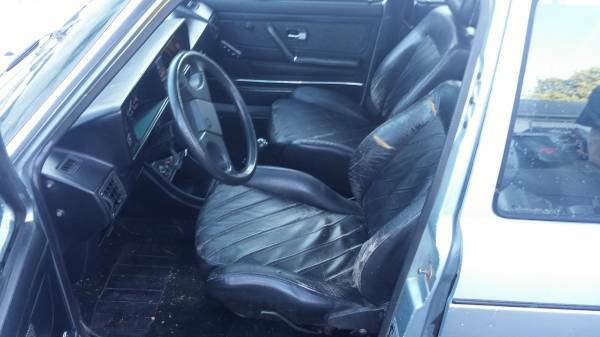 Are those really seats from an Audi urQuattro? The diagonal pattern seems to say yes, and together with the square headrests and later steering wheel, plus the center gauge console (also GLI/GTI equipment), this looks like a well-thought-out car. The seller suggests taking the car out on the highway and seeing what it can do, which suggests confidence in its condition. For a third of the price of a project 2002tii, would you take him up on his offer? This entry was posted on July 15, 2014 at 4:46 pm and is filed under Feature. You can follow any responses to this entry through the RSS 2.0 feed. You can leave a response, or trackback from your own site. let me know if you have the jetta still?